George Graham Reviews Al Stewart's "A Beach Full of Shells"
In the 1970s, Harry Chapin enjoyed considerable success with his so-called "story songs." And narratives have long been a part of the singer-songwriter and folk scenes. 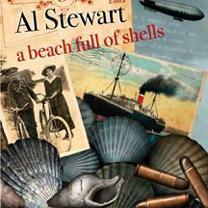 This week we have a fine new recording by a long-time musical storyteller, Al Stewart, whose new CD is called A Beach Full of Shells. Best known in the US for his mid-1970s hit Year of the Cat, Al Stewart has a long musical career, going back to the early 1960s. A native of Scotland, he moved with his family to Southern England at an early age. His biography says that he bought his first guitar second-hand from Andy Summers, who would later be a founder of the band the Police, and took his first guitar lessons from Robert Fripp, who would later found King Crimson. In 1965, Stewart moved to London and served as emcee for a folk club, whose guests included a young Paul Simon, in the period he spent in England, and such English folk luminaries as Ralph McTell, Cat Stevens and Bert Jansch. Stewart released his first album in 1967, Bedsitter Images, which did not see US release until several years later, after Stewart enjoyed some American commercial success. It was his fourth album, Year of the Cat, released in 1976 that yielded the title track as its hit along with On the Border. Over the years, from his California base, Stewart has released a succession of recordings that were remarkably stable in musical direction, but always full of interesting songs, served up in Stewart's pleasant, slightly nasal tenor that always had a kind of proper British sound. It has been ten years since Stewart's last US release, though he has been busy making CDs that were released elsewhere, despite his US residence. That last American release, Between the Wars was one of his finest, a collection of literate narratives taking place in Europe between the World Wars. He was joined on the album by guitarist Laurence Juber, a one-time member of Paul McCartney's Wings, who added a mostly acoustic sound that often evoked that period in time. Now, Stewart renews his collaboration with Juber on A Beach Full of Shells, and again, many of the songs have a distinctly historical aspect to them, though this time, the setting is wider-ranging in time, from the heyday of European royalty to the 1960s. And each time, Stewart creates a wonderfully self-contained vignette which sets the scene and tries to give us a slice of life in the period. In addition to guitarist Juber, who played both acoustic and electric guitar, Stewart is joined by veteran studio keyboard player Jim Cox, bassist Dominic Genova and drummer Michael Jochum, as well as string players who call themselves The Section String Quartet. They are frequently heard in generally tasteful musical arrangements created by Juber. It's remarkable listening to Al Stewart after all these years, at age 60, sounding almost exactly as he did thirty years ago, if not better. And his songwriting powers are definitely at their peak. He remains remarkably literate especially for a guy who left school at age 16. His music also is quite appealing from an instrumental standpoint, with acoustic instruments dominating, and pleasant melodies, with several in waltz time. And his voice has never been better. In some performers, consistency can lead to predictability and uninspired music, merely trying to re-create the old hits. For Al Stewart, consistency in a more than 30-year recording career means keeping a high standard, with first-rate songs, marked by their literate approach and imaginative narratives, along with fine musicianship. Stewart does not record that often, and it has been a decade since his last US studio release, so he has time to develop his ideas into songs that are little narrative masterpieces. A Beach Full of Shells is gem that will delight long-time fans, and perhaps introduce a new generation to a classy musical storyteller. Our sound quality grade is close to an "A." Both the instrumentation and Stewart's vocal are nicely recorded, and the mix puts everything in the right place, and with an emphasis on clarity. One can hear and understand Stewart's every word. The dynamic range is also respectable by contemporary standards, though not quite at audiophile level. It's not hard to find story songs among the works of contemporary singer-songwriters. But a performer with Al Stewart's unfailing level of quality in creating musical narratives is rare indeed. His new CD is an affirmation of that.